Talk about an eye-opening weekend in Major League Soccer. With all teams involved for a change, we got to see what everyone had to offer. Some brought their A-game (LA, Dallas), while others slipped behind in surprising manners (New York, Columbus). Week nine is in the books and right now the Western Conference is slowly starting to pull away from their Eastern rivals like we all expected. Things are a little tight but from what we saw this weekend, the West was dominate for the most part. LA downed KC, Dallas convincingly beat Philadelphia, San Jose thumped Columbus and to the surprise of all, Chivas beat New York…in New York. 1. More on the West. For all the talk going into the weekend about teams from one coast losing on the opposite coast. Chivas put that losing spell to rest yesterday evening. Well, Justin Braun did with his hattrick. New York is already blaming their midweek friendly in Montreal (lame excuse guys), but let’s give praise where it is due. Chivas looked hungrier and fought hard for the big road win. Their defense didn’t look great at times though as they gave up two goals in the first half but Braun is finally finding his scoring touch, which is exactly what Chivas needs to move up the Western charts. 2. Galaxy align stars. 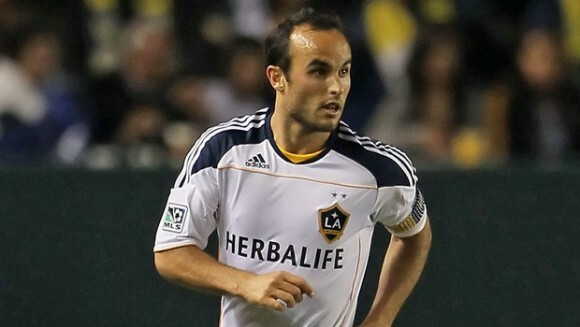 Look out, Landon Donovan is now your Golden Boot leader here with seven goals on the season. Donovan also passed Taylor Twellman for forth place on the all-time scoring list and is only 22 goals behind Jamie Moreno. Yeah I believe he’ll knock him off before long. As for the game, LA looked a bit off at first against KC as evident by their gift of a goal to Sporting. But from that own-goal on it was all LA. Donovan woke up the club with a pair of goals and seeing Juan Pablo Angel score had to be a sigh of relief for some Galaxy fans. But the goal of the night was easily David Beckham’s free kick. It was just scary how well placed that goal was by Becks. 3. Wondo back on for the Quakes. Just like last year, when San Jose is on their game it is because Chris Wondolowski is scoring. Case and point to this week. In their two games Wondo scored in each and the Quakes looked miles better in the process. They were unlucky not to get a result in Vancouver but Saturday night against Columbus, they opened up. Frank Yallop’s club needed a week like this though after the few weeks of terribly play both home and away. Does it mean they’re back on track to be a playoff contender here? Maybe but they still have a long way to go here. Reeling off a couple wins here in the next couple weeks won’t hurt their chances though. 4. Cascadia Cup still fun in the rain. Of course it would rain in the first MLS meeting between the Portland Timbers and the Seattle Sounders. But the Qwest Field crowd still made it buckets of fun. I think one thing is certain, the Seattle fans are still the loudest in the league because of that stadium. While JELD-WEN Field is more intimate, Qwest just echos the sound. As for the game it was about what I expected. I know I had the Sounders in a tight win but seeing them draw didn’t shock me at all. Seattle lacks that final touch in the end to put a beating on the Timbers defense while also failing to mark up on set pieces. Portland earned the draw and looked much improved on the road in the process. So as I say that, it doesn’t change my opinion on their road play all that much, they still need a win to gain more respect and I know John Spencer agrees with that. But they are on their way to one here. 5. Dallas on the rise. Don’t look now but FC Dallas has won four of their last five and are unbeaten in the month of May so far. They still have three big Western conference battles left this month including the last two on the road next week. Still, Saturday night against Philadelphia they put the hammer to the Union. It was shaky at first but once this club settled into the match, the offense took over and gave the Union their first two-goal loss of the season. What is more amazing is that the Union hadn’t given up more than one run-of-play goals all year and both Fabian Castillo and Brek Shea were able to score in that manner. Like I said in my Big D Soccer recap, once Shea, Castillo and Marvin Chavez get on the same page this club will start scoring more goals in bunches. With their defense posting shutouts, it could be another fun year for Dallas. 6. Frustrating Toronto. After seeing Toronto in person on Wednesday, I thought to myself, these guys aren’t half bad. And for nearly 70 minutes against Chicago on Saturday they looked that way as they had a nice 2-0 lead thanks to rookie Joao Plata. But then Marco Pappa took a brillent free kick and the game seemed to get lost for the Reds. Toronto then sucked back into what we’ve seen out of them so far this season. A frustrating team that has potential but continues to find ways to drop valuable points. 7. Brawl in Rio Tinto. Like fouls and not shots? Well the Houston-Real Salt Lake was a game for you then. I know the stat sheet reads 30 fouls to 21 shots combined but it felt like there were far more fouls in this one. Amazingly enough there were only two yellow cards. I think what Houston showed the league was you can go into Rio Tinto right now and be physical with RSL and come away with a point. Without Javier Morales in the midfield, RSL lacked a creative punch in their offense. Guys like Alvaro Saborio really need to step up for this club at the moment or they could struggle. 8. Uh-oh for Charlie. Charlie Davies little audition in-front of USMNT head coach Bob Bradley did not go well. His couple chances on goal showed he still has some mental errors to overcome while picking up a little injury also didn’t help his chances at making the Gold Cup roster. Part of me thinks Bradley will still pick and give him a shot but for D.C. they need a healthy Davies going forward here. His comeback story is still being written folks, I’m sure it will have a happy ending. Impressive for sure. Though it did come right after the Portland goal, say it came at the start of the game then it would have folks really talking. Having just rewatched the game on my DVR, most of the chants/songs that you can hear on ESPN throughout the game are from the Timbers Fans with a few exceptions. In week 9 we learned that the only noise from Seahawks stadium during ESPN telecasts are from Timbers fans whether Portland is playing that day or not and that both supporter groups have zero overlap in song usage.